For Kids’ Sake Montessori is a facility of excellence with an experienced team of dedicated Montessori educators and administrators. Our vision is to provide a rich, nurturing educational environment for infants, toddlers, preschool and kindergarten aged children in Southfield, MI. 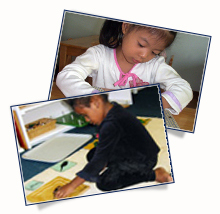 The Montessori philosophy is based upon mutual respect and belief in the child and hands on educational experience. The basic aim of the Montessori approach is to cultivate the natural curiosity and delight in discovery that is present in all children. Certified Montessori teachers, who are specially trained in the philosophy, curriculum, and use of Montessori materials, head our classrooms. The most important attribute of these special people is that they understand the inner need of the child to explore and know the world. They dedicate themselves to the preparation of a warm, inclusive classroom environment that fosters creativity, cooperation, independent thinking, self-discipline, and respect for oneself and for others. Studies have revealed that children who are motivated from within, opposed to being continually prompted by outside forces such as teachers or strict curriculum requirements, tend to be life long learners whose goals continually expand as do their interests and passion for understanding their environment. Dr. Maria Montessori believed that every child carries within herself the unseen person that she will become. In order for children to develop their physical, intellectual and spiritual powers to the fullest, the child must have freedom. This freedom, she felt, flowed from the development of cooperation, independence, self-discipline and respect for one another.